The Bible describes nine separate end time wars. We have looked at the first two of these conflicts — the War of Extermination based on Psalm 83 and the First War of Gog-Magog based on Ezekiel 38-39. The next two end time wars we addressed in the sequence definitely take place in the Tribulation — the Conventional and the Nuclear Wars of the Tribulation. The fifth end time war takes place in the heavens, while the sixth is waged on Earth by the Antichrist against the Jews and the Tribulation believers in Jesus Christ. Satan and his angels are opposed in this war by Michael and his angels. Michael is an archangel who is pictured in the Hebrew Scriptures as the commander-in-chief of the armies of God (Daniel 10:13, 21 and 12:1). Michael and his angels prevail in this war, and Satan is cast down to earth. 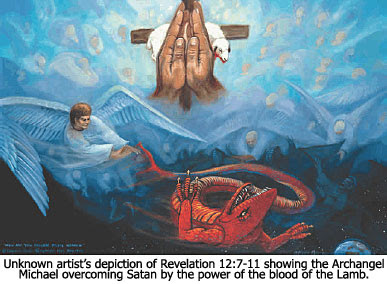 His access to God’s throne is cut off (Revelation 12:9-10). They are the Chosen People of God. God used them to provide the Scriptures to the world. It was through them that the Messiah came. God has promised that He will bring a great remnant of them to faith in His Son at the end of the Tribulation. There is going to be another holocaust during the latter half of the Tribulation. When Satan is cast down to earth, he will possess the Antichrist (Revelation 13:2) and inspire him to annihilate all the Jews. 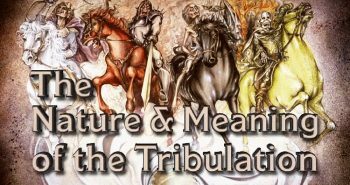 This is the reason that Jesus referred to the last half of the Tribulation as “the great tribulation” (Matthew 24:21) — not because this half will be worse than the first half, but because the wrath of Satan will be focused on the Jews. Some of the Jews of Israel will flee to a place in the “wilderness” where they will be supernaturally protected by God (Revelation 12:13-14). Many believe this hiding place will be the ancient city of Petra, located inside a box canyon in modern Jordan. There is good reason for this assumption because Daniel 11:41 says the Antichrist will be prevented from conquering Jordan when it is part of an end time rebellion. But Zechariah 13:8 indicates that two-thirds of the Jewish people will be killed by the Antichrist during this time, and Revelation 12:17 says the Antichrist will also war against the “offspring” of Israel — namely, those “who keep the commandments of God and hold to the testimony of Jesus.” I believe this is a reference to all those who accept Jesus as their Lord and Savior during the Tribulation, both Jews and Gentiles. It is no wonder that Revelation 7:9-14 pictures a great multitude of martyrs in Heaven, so great that it cannot be counted. They are identified as “the ones who are coming out of the great tribulation, and they have washed their robes and made them white in the blood of the Lamb” (Revelation 7:14). In the fifth installment of this “End Time Wars” series, we will look at the seventh and eighth wars in the end times sequence — both the Middle East Campaign of the Antichrist and we’ll finally address the Battle of Armageddon. Hello Dr.Reagan, last time I preach in Church my theme was the accuser Satan!! It is a beatifull theme, Praise the Lord!! God Bless You Dr. Reagan!! Glen, I agree about the UFO theory, and I think we can safely add "ghosts" to the theory. I have long believed that they are a physical manifestation of spiritual beings meant to deceieve and entrap humans who are not covered by Christ's blood. And, for the record, before I gave my life over, I saw things in the night sky that gave me pause and scared the daylights out of me. Since coming under Christ's blood, I haven't seen one thing. I had long studied the UFO phenomenon (both as an unbeliever and as one) and this is my conclusion: UFO's are EVIL!!!! From what I have gathered, most unexplained sightings (i.e., not an airplane, Venus, etc.) are witnessed by people who are into spiritism, the occult, witchcraft, etc. I agree with you guys. I do believe that UFO's are demonic. The Bible says that Satan has power over the earth and the "heavenly realms". And, has anyone EVER heard of an alien abduction or encounter that was good? All the ones I have ever heard or read about were terrifying, and often sexually preverted. On another website that I blog on, I started a thread asking if anyone thought that UFO's were of demonic origin, from a religious standpoint. I got a lot of kooky answers (of course) but, the thing that floored me where some of the responses that I got from Mormons!! They said that if UFO's/Aliens existed that they would see them as more of God's children, since God created the heavens and the earth and all that is contained in it. Yips! jude 1:6 "and the angels who did not keep there first estate but left they're habitation these he has kept in darkness, bound in everlasting chains for judgment on the great day"
jude 1:7 "and IN LIKE MANNER (sexual perversions) sodom and gomorrah and surrounding towns gave themselves up to sexual perversion"
"as in the days of noah so shall it be when the son of man is"
"and the stars of heaven (angels)shall fall to the earth"
sounds a lot like alien abductions doesn't it? Hey where did my LOVE, KNOWLEDGE, and of the TRUTH go? FOR BEHOLD BEWARE OF THE STRONG DELUSION. ARE YOU SHUTTING THE KINGDOM OF HEAVEN? ARE YOU NOT CONCERN OF NOT ENTERING?